Railpictures.ca - Dave Burroughs Photo: Old meets new. It is spring of 1968 and CN 4593 west meets SD-40′s CN 5047-5046 east at the Plains Rd. bridge. Looks like auto parts on the head end possibly destined for Ford in Oakville. | Railpictures.ca – Canadian Railway Photography – photographie ferroviaire Canadienne. Caption: Old meets new. 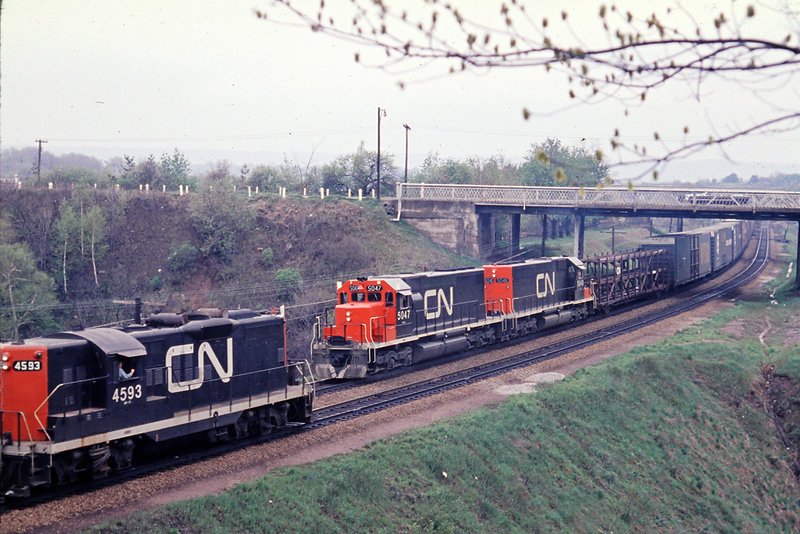 It is spring of 1968 and CN 4593 west meets SD-40's CN 5047-5046 east at the Plains Rd. bridge. Looks like auto parts on the head end possibly destined for Ford in Oakville. I actually had the tree trunk in there on the right as well but it did not look good when all was said and done. You likely could not take this angle today as all of the trees and bushes have grown on the embankment and obscured the shot. It would be lumberjack time. Yet another terrific “wow…scenery” shot. Time to get the brush cutters out.